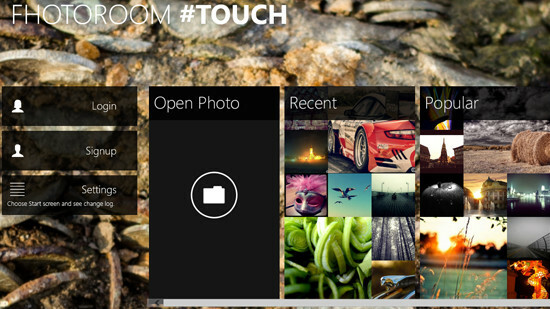 Fhotoroom is a photo editor app for Windows 8 brought by Thomas Lock to help you edit your photographs seamlessly. Fhotoroom photo editor starts with the main page having an option to open your own folder or album of photos or browse recent, popular and interesting photos from the collection of other people. The startup page settings can be changed and the photo editor can be chosen to open directly at startup of the app. You can import the photograph you want to edit from the computer to Fhotoroom to edit. There are many options that can help you edit the photograph like crop, straighten, color correction, denoise, etc. After every edit you will have to apply it to the photograph manually. One of the best features of Fhotoroom is that it lets you see before editing version of the photograph as well from the editing panel. You can click on Before once to see the old or original version of the photograph and then click on it again to see the edited version of the photograph. There are numerous preset settings that can be applied on the photograph to give it different look like vintage, sepia, black and white, lomo, etc. There are two options from the menu that are locked but can be purchased if needed. 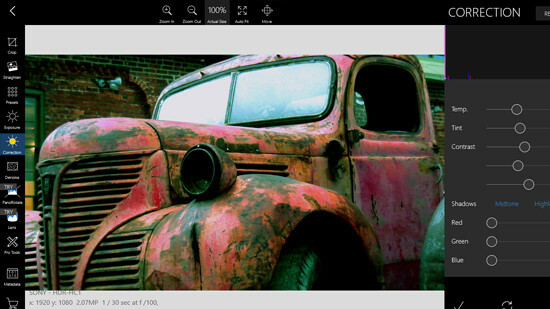 With Fhotoroom, you can crop the photograph according to your wants. It also lets you straighten the photograph if you think it needs to be corrected or changed. The metadata of the photograph can also be viewed below the photograph itself. To share your photographs with the community or to share them on Facebook or Twitter you will have to register with Fhotoroom first and then it will enable you to share the photographs you edited with the community or with your friends. 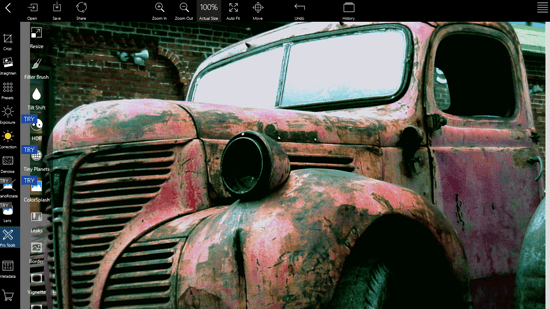 There are many Pro Tools to edit photographs using this photo editor for advanced users. These Pro Tools include resize, filter brush, tilt shift, leaks, border, vignette, vigpro and color shift. There are three more Pro Tools named HDR, tiny planets and colorsplash, but these tools are only accessible if you have purchased them otherwise you can only apply them and not apply and save the results. Fhotoroom supports all major RAW file formats for editing directly on the RAW files of the captured images, apart from these it also supports JPEG, PNG and TIFF for editing. You can also browse the history of all your edits done to the photograph using the History menu.